Baking cookies with kids is one of those things that sounds so wonderful when you’re pregnant. You picture yourself with your angel children carefully measuring and pouring ingredients in your well-stocked, immaculate kitchen all while wearing matching aprons with just a little dab of flour on your rosy cheeks. It’s a perfect Martha Stewart moment. You’ll do it every week! It will be magical! Memories will be made! Then you actually have the baby and see how absolutely ridiculous this idea is because you don’t have time to even take a shower by yourself, much less go to the store, get ingredients, bake cookies, and clean up. I’ve always loved baking, but I’m definitely a control freak in the kitchen and just couldn’t see how to involve my kids without making it a miserable experience for all of us. I like baking – it brings me pleasure and relaxes me, so adding my kids to the mix seemed a little ridiculous so I avoided it for a long time. 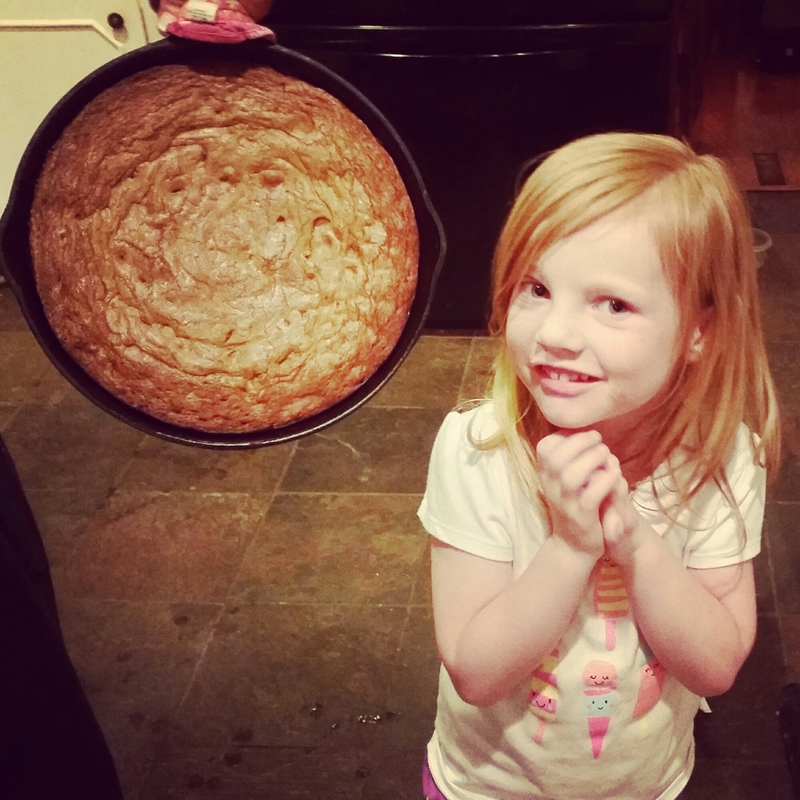 But baking with your kids really can be awesome if you do it right. First, if you can manage to do it with one kid instead of 2 or 3, it’s much better. Second, I suggest starting when your kitchen is already a mess – because it will definitely be one by the time you’re finished. Finally, young kids don’t have much of an attention span. Make something fast and easy, or only involve them in a small part (trust me on this – if you’re going to make, cut out, bake, frost, and decorate 100 Christmas cookies, spread it out over a few days and only make 20). 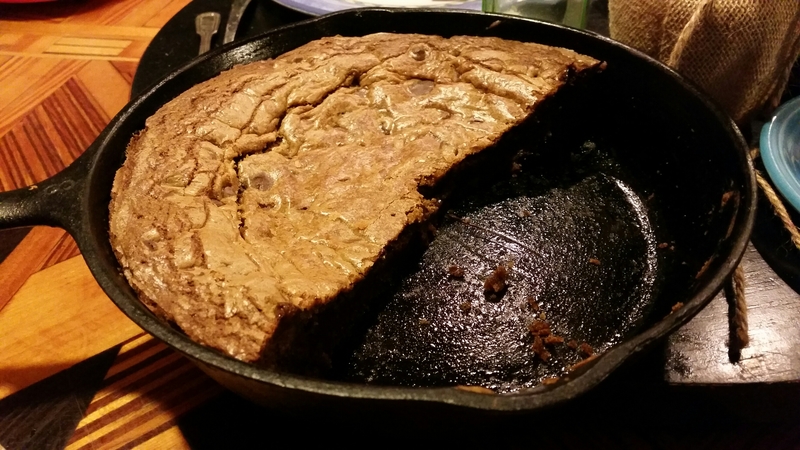 This skillet cookie cake is one that RG and I make together a lot. It’s one bowl, there’s plenty of fun measuring and pouring to do, you probably have all of the ingredients on hand, it’s forgiving, and it takes about 20 total minutes. No scooping our individual cookies, waiting for anything to rise, frosting – nothing. You mix, pour, and bake. It’s also absolutely heavenly. Preheat the oven to 350°. In a large mixing bowl or bowl of your stand mixer, cream the butter and both sugars together until light and fluffy. Add the vanilla and eggs one at a time, mixing and scraping the bowl between additions. Mix in the baking soda, espresso powder, and salt until everything is combined and smooth. Add the flour one cup at a time, making sure the first is fully incorporated before adding the second. Fold in the chocolate chips. Grease an 8″ cast iron skillet (I just spray a little vegetable oil on mine) and pour the batter/dough in, using a spatula to smooth out the top. Bake for 35+ minutes, until the middle is set and a toothpick comes out clean. Let the cookie cake cool for 20 minutes, but then serve warm out of the skillet, preferably with a scoop of homemade vanilla ice cream.